Richard Amon was named Collingwood's inaugural Best and Fairest winner on Wednesday night. 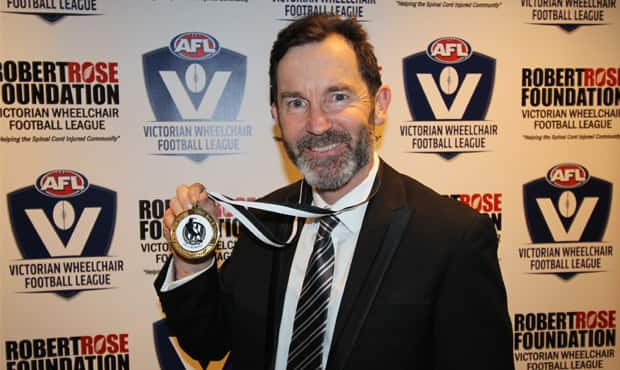 Collingwood’s outstanding debut Wheelchair Football season has been duly recognised at the league best and fairest awards. The Maurice Rioli room at Punt Road hosted the inaugural awards ceremony, which saw most valuable players announced from every club and a Team of the Year named. Richmond Amon was recognised as Collingwood’s best player, after a season which consisted of 46 goals and nine in a Grand Final victory over Richmond. The forward was also named on the interchange bench of the league Team of the Year, while Magpies’ captain Brendan Stroud was listed in defence. St Kilda’s Patrick McKay won the league B&F with 32 votes, ahead of Richmond’s Riley Fitzgerald (25) and Amon (24). Stroud and Mark Walker were other Magpies’ named in the top 10 vote-getters. The ceremony capped a near perfect season for the VWFL Magpies, who completed an undefeated season with a 60-point victory over the Tigers in the Grand Final. REPORT: Pies victorious in VWFL decider. Read the match report here. Collingwood captain-coach Brendan Stroud was named in the VWFL Team of the Year on Wednesday night.